Emma Mills books always make me happy and Famous in a Small Town was no exception. It’s been awhile since I smiled so much while reading a book. As I’ve come to expect from Mills’ books, there are strong themes of friendship and family. I loved Sophie and her group of friends. There is so much effortless banter and I am completely here for it. I think that is one of the reason why I love books by this author so much. They are exactly my sense of humor. While I loved the group of friends, a few of them – Flora, Dash, and especially Terrence – could’ve been a little more developed for me. Brit was well developed, but she was probably my least favorite person in the story. She was kind of the “wild” friend with a backstory that never really made sense to me. Which brings up another issue that made parts of the book not work for me. Several of the characters have some kind of heavy things happen to them, but none of them were really given enough attention to feel like anything more than a random side plot. A couple of them come kind of completely out of left field and then were never really explained or fully explored. I appreciated what Mills was trying to do with these storylines, but I just don’t think it worked here. I think if she would have picked one and focused on it, it would have worked a little better. Enough with the negative, though, because I really enjoyed everything else. I loved Sophie and August together and really shipped the romance. I felt like they clicked from their very first scene together and then it just kept getting better. There’s some requisite angst here and there, but it still worked for me. I also really loved August’s brother and his family, who Sophie does a lot of babysitting for. 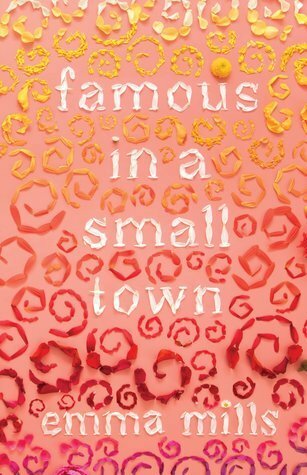 Overall, I really enjoyed Famous in a Small Town. I love how addictive Mills’ writing is and how even though it doesn’t feel like a lot is actually happening in the story, I never want to stop reading it. I loved the humor, the romance, the friendships, and that beautiful cover and I will be anxiously awaiting Mills’ next book. Addictive writing sounds good to me! Great review. Thank you! I always fly right through her books. It really was! I hope you get a chance to read it! I’ve seen this book everywhere on people’s “to read” lists–so glad you reviewed it! It was cute! I hope you decide to try it out! I enjoyed reading your review. The points that you made were good ones and I’m glad it worked for you despite your misgivings. Thank you! I always enjoy her books. I gave it 4 stars, actually, which is still a good rating for me 🙂 I hope that the things that bugged me about it don’t bug you. It was still overall a happy read, though! And that’s awful that your local store didn’t have a copy of this book!!! I actually was first in line for it at the library, though I will eventually buy it because I have her other books and the covers are so darn pretty! I really want to give this author another go. I’m eyeing this one and Foolish Hearts. I always like the sound of family and friendships in contemporary books, so this might be my next read from her. Nice review! Thanks! I don’t really think you can go wrong with any of her books. I’ve really enjoyed all of them. Thank you! I always enjoy Emma Mills books! I hope you enjoy it, as well! Great review! I’ve only read This Adventure Ends by Emma Mills which I really enjoyed. I agree that her writing is addictive! I received an ARC of this for review, so I’m gonna read this in Feb. I hope that you love it! I’ve really enjoyed all of her books. Great review! I recently picked this up from the library and can’t wait to start it. Thank you! I hope that you love it! Her books make me happy. I have this one on reserve at the library. I enjoyed This Adventure Ends sooo much last year. I really need to read all of Mills’s books!! I hope you love it! While This Adventure Ends is still my favorite of hers, I do really love all her other books, as well. It just came in from the library!! So I will hopefully be reading it soon.